To say it has been cold in the SF Bay Area recently is an understatement...it is freaking frigid (especially for So Cal natives like myself)! During the brief weekend rain I discovered my umbrella has gone missing, which was a perfect excuse to stay inside and shop online for a new one. And what better to pair with a fashionable umbrella than a fun pair of rain boots! 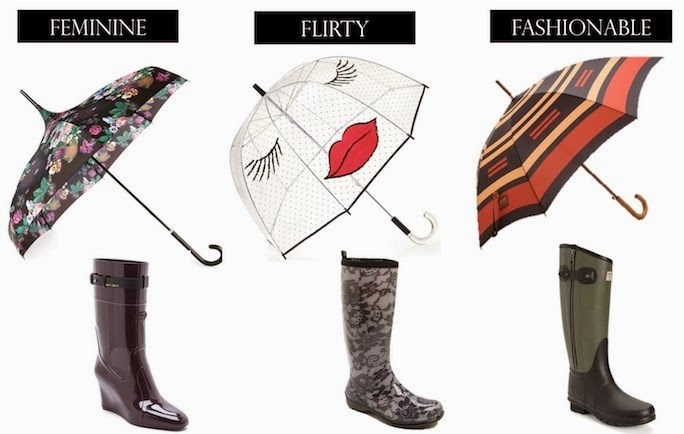 I'm sure any of the fab and functional umbrella and rain boot pairings below will help keep away the rainy day blues. Now the hard part - to pick a favorite! These are all fabulous! I love that you paired each umbrella with its own rain boot :) My favorite set is the one in the middle. How cute are those lace boots? Love them! give the flirty umbrella and fashionable boots - chic! So cute! That flirty umbrella is the best. The fashionable combo is my fave! I so want this kissy face umbrella. I really like that flirty umbrella! Love the cute umbrella in the middle.